After being in development since the last century, the DC comic book character, Green Lantern, premieres in North America this week as a live-action film, starring Ryan Reynolds, Blake Lively, Peter Sarsgaard, Mark Strong, Tim Robbins, Jay O. Sanders, Taika Waititi, and Angela Bassett. The International releases are still approximately a month away. In case you are unfamiliar with the comic, this original story follows a human named, Hal Jordan, who is chosen by the Ring of Will to become a guardian of the universe as part of the Green Lantern core. While this story has been told before through DC Comics and Warner Bros Premiere branch, this is the first time it is being told as a live-action film. Hype for this Green Lantern film has been off the charts with die-hard fans of the franchise. I can remember back to Comic Con 2010, where an audience of over 10,000 people in Hall H cheered while Ryan Reynolds was on stage taking the Green Lantern Core oath. However, hype and expectations do not always lead to an amazing film; and in the case of Green Lantern, it is the exact opposite. Trying to pinpoint the exact place that Warner Bros and DC comics dropped the ball on this 300-million-dollar-film is hard to say. From the excessive use of computer graphics, to the horrible story with one-dimensional characters, to the campy cartoon'ish action it does not hit any element on mark, but rather fizzles like a Green Lantern ring that needs recharging. Director Martin Campbell (Goldeneye, Casino Royale) and Warner Bros. appear to be trying too hard to appeal to every type of movie audience for this film; and instead of going in the serious somewhat "grounded in reality", comic-book motif, ala "The Dark Knight" or "X-Men: First Class", they choose the campy route that brings to mind such disasters as Joel Schumacher's, Batman Forever and Batman and Robin. Even though the cast of Green Lantern is comprised of veteran actors, they can only do what they can with what is given to them; and in the case of Green Lantern, it is limited to the point that even Tim Robbins and Angela Basset can not give life to their roles. With amazing reference material, Warner Bros. was hoping that Green Lantern would supply them with a new franchise (and rightfully so) since the Harry Potter series is concluded this summer. However, it now appears they will probably have to look elsewhere to fill Potter's void, change the franchises style, or stick to making their amazing animated Green Lantern films on Warner Premiere. 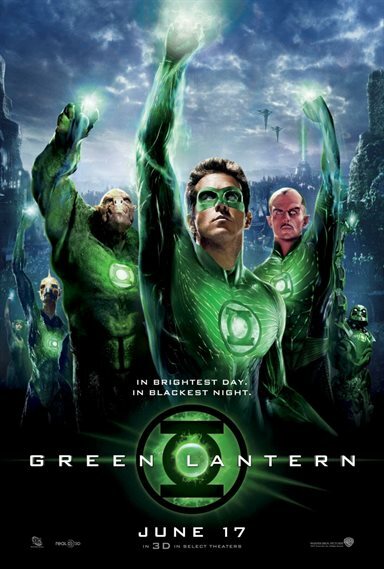 Download Green Lantern from the iTunes Store in Digial HD. For more information about Green Lantern visit the FlickDirect Movie Database.